If you missed out on picking up the incredible new PVC Mystical Warriors of the Ring mini figures at New York Comic Con, you’re in luck! These go on sale online today! 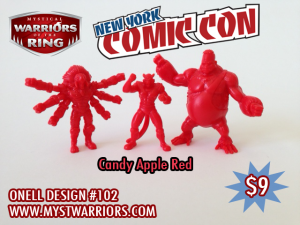 Both the Candy Apple Red 3-pack and the Flesh 3-Pack will go on sale around Noon CST today through the True Cast Studio Store! Don’t miss out, as there are limited sets that will surely sell out fast!